While popular now, speculative fiction publishing in Canada was comparatively rare as recently as the early 1980’s. It wasn’t until 1985, for instance, that the first of the acclaimed “Tesseracts” anthologies came out. The editor(s) have changed with every edition of this long-running series, giving each volume its own unique flavour. 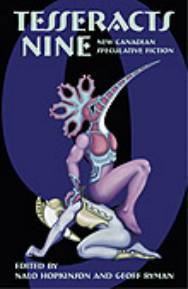 As such, the recently released “Tesseracts Nine”: New Canadian Speculative Fiction features a diverse range of science fiction and fantasy stories and poems from 25 Canadian writers. (Interestingly, the original “Tesseracts” books were published by Press Porcepec right here in Victoria, with the first one being edited by the late Judith Merrill. Tesseracts Books in Edmonton, and now Edge Publishing in Calgary have continued the series. “Speculative fiction” is a term often used to categorize the combination of fantasy and science fiction, and some of the stories chosen by editors Nalo Hopkinson and Geoff Ryman for “Tesseracts Nine”, live in that undefined grey area between speculative fiction and mainstream fiction. If you’re looking for some John Norman style hack and slash fantasy, or space battle / space opera style science fiction (ala E. E. Doc Smith), this is likely the wrong anthology for you. But if you’re looking for character-driven fiction with high literary standards, then this collection has a good chance of being to your liking. Steve Stanton’s story “The Writing on the Wall”, Is one of the stories on the science fiction side of the speculative fiction spectrum. After a visit at age eight from his future-self, a man spends his life obsessed with figuring out time travel; yet while he struggles with mathematics and physics, social interaction, social interaction rules manage to elude him. Also In the science fiction realm, "Mayfly," by Peter Watts and Derryl Murphy, considers the implications of such complex issues as artificial intelligence and parenting a difficult child - all wrapped within the subject of a scientific study which is sentient and self-aware. This story receives what tends to be the highest praise I give fiction: not only did I enjoy it, but it made me think. Finally, Jerome Stueart's "Lemmings in the Third Year," arguably runs down the centre of the fantasy / science fiction spectrum. This story focuses on a character spending time in Canada’s north, studying and talking with the various animals there. One thing I liked about this story was the lack of an explanation as to why the lemmings and other creatures were capable of human speech. This left the reader to decide if it’s a matter of magic or a similar fantasy effect, or if it’s some other, more science fiction, phenomenon such as genetic engineering. The author uses the allegory of talking with lemmings, to discuss many people’s misconceptions of the methods of science. With “Tesseracts Ten” already in process (edited by Canadian writers Robert Charles Wilson and Edo Van Belkom) it’s clear Edge Publishing intends to continue this Canadian tradition. Watch for “Tesseracts 10”, to be released sometime in 2006. Published in the October 13 – 19 issue of Monday Magazine.